Chukwa Adaptors emit data in Chunks. A Chunk is a sequence of bytes, with some metadata. Several of these are set automatically by the Agent or Adaptors. Two of them require user intervention: cluster name and datatype. Cluster name is specified in conf/chukwa-agent-conf.xml, and is global to each Agent process. Datatype describes the expected format of the data collected by an Adaptor instance, and it is specified when that instance is started. 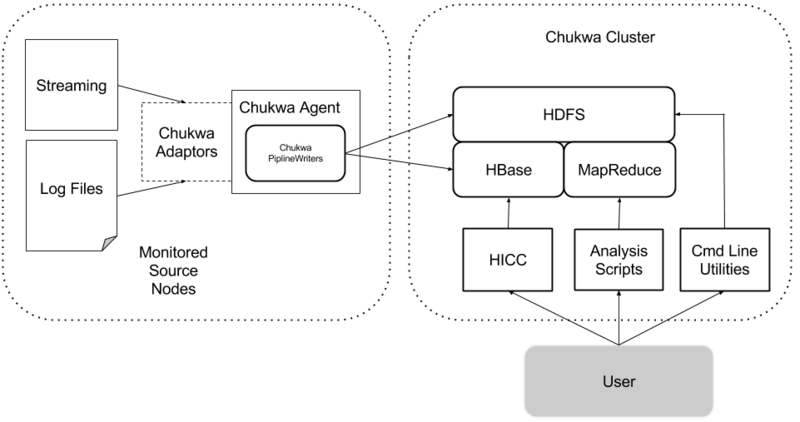 Chukwa Agents can write data directly to HBase or sequence files. This is convenient for rapidly getting data committed to stable storage. HDFS provides better throughput for working with large volume of data. It is more suitable for one time research analysis job . But it's less convenient for finding particular data items. As a result, Chukwa has a toolbox of MapReduce jobs for organizing and processing incoming data. The origin design of collector is to reduce the number of TCP connections for collecting data from various source, provide high availability and wire compatibility across versions. Data transfer reliability has been improved in HDFS client and HBase client. The original problem that Chukwa Collector tried to solve is no longer high priority in Chukwa data collection framework because both HDFS and HBase are in better position in solving data transport and replication problem. Hence, datanode and HBase Region servers are replacement for Chukwa collectors. Chukwa has adopted to use HBase to ensure data arrival in milli-seconds and also make data available to down steam application at the same time. This will enable monitoring application to have near realtime view as soon as data are arriving in the system. The file rolling, archiving are replaced by HBase Region Server minor and major compactions.